Days belonging when our things getting old, sometimes we started to refuse it to use, but, yes, absolutely it depends on what type of product it is. Maximum of our using products get finished, some get damaged by using, and some be good in quality after years of usage. In that cases, normal and human necessity products like clothes, shoes, sometimes books after reading for many times get old for us. Then we want to donate it or sell it. Here you will get info about clothes donations to the charity. So, according to my first three-four sentences, if anybody wants to donate his/her used clothes, or even new clothes, then what he/she have to do!!! For a better donation success, what kind of steps he/she may take!!! This all answers which are hitting your mind, this time, will all be answered by us today. Just keep reading and focus. Donating clothes is a very helpful idea, if you are going through that, then I am sending you an advance thanks from me. Because these are the most developed and well-mannered way to help someone and don’t let it be a garbage. These donated clothes will be helpful for many people. And it also will be a fine filling for you. Charities are there who expects this, whatever you may also donate your clothes to the slams, to the poor people by hand, this is also a goodly idea, but, as I see there is no such procedure and formalities which a man have to follow to do that. So, just focus on the charity donation processes because it requires some formalities and ways which men have to know. How to donate clothes to clothes box foundation. How to donate clothes to Goonj. How to donate clothes to homeless. Find that how many t-shirts, sweaters, skirts etc, you have is that really necessary for you, or it may go. Check that all the items at your home for the individual personality do really fit well in the body, or lapsed. Check that how many clothes you have for your little baby, is all really need or need to be donated. After confirming all the clothes, find out that is not there anything lost in the pockets of these clothes. Because if the clothes having money, jewellery or other expensive things then you might not get it again. Wash the clothes before donation, because this is better for reuse, and a high cause is if your clothes are dirty and bad looking then they might not be considered as a reusable product. They might give it to the garbage for recycling. Wash the baby clothes with non-fragrance detergent, because it is good for baby’s skin. A good quality shoes, if you are not going to wear them again. Professional clothing that is especially very demandable like the jeans. Besides clothes you may look for, belts, purse, gloves, and hats if you are not going to use them then it is a very good idea to donate these things for helping any person. Look for some used but good condition towels, blankets and sheets they will be very useful for the animals because they take shelter in it. And you may also donate new products. Put all the items in a suitable container: Fold and maintain all clothes and other things in a good container, because the better the clothes will be the better chance to resolve. Find out a drop-off point: This is the last option you have to do. Just find out a charity center, where your clothes will be taken, and will be donated to the pools. There are some formalities and techniques fill ups what you have to follow when confirming the donating, like, documentation. But this will be very easy. Consider making regular donations, it is a good habit and besides it helps very much to the seekers. 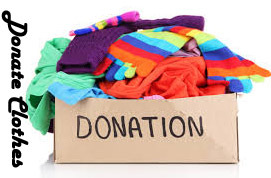 How to donate clothes to clothes box foundation: Box foundation is a recently opened foundation in India, by the members named Saajan April and Naman, people of New Delhi. This has 16 genuine members in its bench and all are from the various states, so it is strong enough to be stable. This has opened in 2014 and having their successful works till date. They already have donated their collected used clothes 500 of people till date. So, it is really going well. Box foundation connects people via Facebook, and then after confirmation they take the clothes. So, you may connect them by Facebook, and after contacting to their page the total procedure will be held. How to donate clothes to Goonj: Goonj is also an NGO, which runs a campaign called “Vastra Samman”. There is a same idea like box foundation. You may find a Goonj center in your city or just go their site named – http://www.goonj.org, and then click on “GOONJ Offices & Dropping Centers” for the donating options. There are some rules, so after visiting the site of going you will be aware of all of them. These are the two successfully growing foundations in India which really helping the poor to have a better life. So, you may help them and be with them by donating your clothes. How to donate clothes to clothes box foundation, goonj NGO, homeless people and charity. Copyright © 2016 Donate Bits All Rights Reserved.